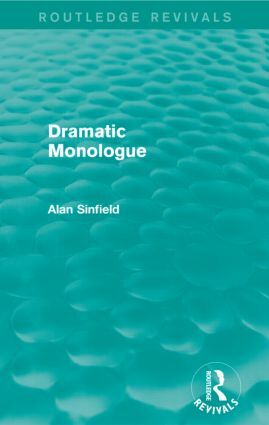 First published in 1977, this book looks at the versatile literary form of dramatic monologue. Although it is often associated with Browning and other poets writing between 1830 and 1930, the concept has been employed by diverse poets of multiple periods such as Ovid, Chaucer, Donne, Blake, Wordsworth, Philip Larkin and Ted Hughes. In this study, Alan Sinfield demonstrates and analyses the range and adaptability of the form through detailed examples. He shows that the technique maintains a shifting and uncertain balance between the voices of the poet and of his created speaker; when extended, as in Maud, Amours de Voyage, The Ring and the Book, and The Wasteland, the use of dramatic monologue raises questions of personality and perception. In the second part of the text, the author discusses the origins of Victorian and Modernist dramatic monologue in the dramatic complaint and the Ovidian verse epistle of earlier periods, offering a new interpretation of the value of dramatic monologue to Browning and Tennyson. Through his writing, Alan Sinfield successfully highlights the eternal vibrance of the form.